Hyson Products, Brecksville, OH, has issued literature on Tanker B (TNKB) nitrogen gas springs, which offer 25 to 35 percent more force than the Super Tanker gas springs they replace. 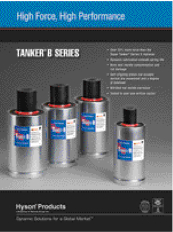 The brochure details TNKB features including patented dynamic lubrication to reduce heat buildup and extend spring life; a bore seal to resist contamination and rod damage; and the corrosion-resistant nitrided rod, self-aligning to accept normal die movement and a degree of sideload without damaging the cylinder seal surface. The spring is offered in four sizes, in strokes to 7.87 in. It incorporates an SAE-4 port to accommodate standard full-size hoses, and has six flanges available for mounting.